Remember those snow cones you loved to eat at the show when you were a kid? That pyramid of pearly-white ice was flavoured with your choice of syrup, each brightly coloured so there was no mistaking the flavour- green for mint, red for raspberry, yellow for pineapple and so on. What I didn’t know then was that a form of the snow cone was the precursor to our modern sorbets and ice creams. Ice and snow harvesting goes way back. Mesopotamia probably had icehouses as far back as 2000BC and the Greeks and Romans carried snow down from nearby mountains to use as both preservative and to cool wine and other drinks. It was the Arabs that brought the sherbet- iced drinks flavoured with fruit purees such as pomegranate, cherry and quince – to Europe. But it was in the Kingdom of Naples, under Spanish rule, where the development of flavoured ices took off to eventually become what we think of as modern gelato or ice cream. Making smooth-as-silk gelato and sorbet is difficult to do at home if you don’t have an electric churner. This machine works by churning and freezing a liquid, at the same time, inside a container. By keeping the liquid moving, ice crystals don’t have time to develop and the result is frozen but very fine-textured ice. 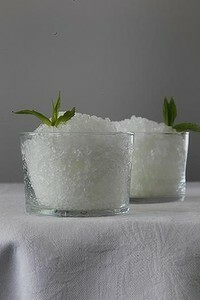 Granita is relatively simple to achieve because, as the name suggests, a certain amount of grainy texture is desirable. Rather than just freezing our mixture solid into an ice block, we restrict the crystal development by whisking the mixture every so often to a slush and then refreezing. The result will take you back to your childhood. I know it does to me. Once made, granita keeps in the freezer for a maximum of 2-3 days. After that, the lemon will oxidise, develop bitter flavours and taste dull. Wash mint leaves thoroughly and dry well. Place them in an airtight container with a litre of filtered water and keep refrigerated for 24 hours. Cold infusion, to my mind, works better than heat with mint. It imparts the fresh flavour without the “stemmy” bitterness and doesn’t leech the green from the leaves, keeping the granita white. Bring remaining 250ml water and sugar to the boil. Remove as soon as it’s boiling and let cool. Sieve mint infusion through muslin to remove any fine particles and stir into cooled sugar syrup, along with lemon juice. Place in a clean, shallow, plastic container, with a lid, and put into the freezer. After an hour, it should begin to freeze. Remove and give mixture a quick whisk so it forms small crystals rather than setting hard. Repeat every 15 minutes until it has set. Serves 8-10. This granita can be made from a single type of berry, like raspberry or strawberry, or a combination. If using strawberries, they need to be ripe and any tough, unripe part near the stem should be removed. Place all ingredients into a food processor and pulse to a thick, smooth purée. Place in a shallow, plastic container with a lid and put into the freezer. After an hour, it should begin to freeze. Remove and give mixture a quick whisk so it forms small crystals rather than setting hard. Repeat every 15 minutes until it has set. Serves 8-10.